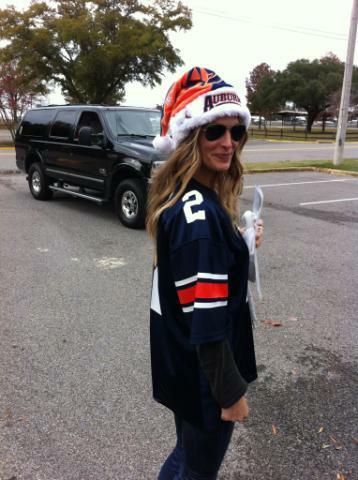 Actress, model, and apparent Auburn superfan Molly Sims is back, this time in an Auburn Santa hat. If you missed it, here she is at the Iron Bowl. We’re working on an interview. Hi Molly, my name is Walt. I would very much love to meet with you and talk to you about your Auburn super-fandom as well. I believe we would have a lot in common. Generic other sentences go here. Thank you for your time. Checkmate, Ashley Judd and UK. Walt, I will see your deployed soldier and raise you a twice deployed Marine and current Auburn student. Cheers. Why can’t all bandwagon fans look like that. Yes if she’s a vandy grad I’m calling her a bandwagon fan! On a kind of separate note, let’s all welcome back the bandwagon fans that jumped on us in ’04, then to bama in ’08, and are coming back to us again. Nice, Dan. This is my second deployment as well, and I’m a 2004 Auburn alum, lol. Trying to decide now if I’m going to make it 3 times next winter, but that’s a whole ‘nother story. Semper Fi, my friend. Once again proof TWER is the best source for real Auburn scoops. Welcome, Molly! Hope you enjoyed the game,,,hang on for the ride,,,it’s been great!! I was at the game,too, LOVED it:) WDE!! Walt and Dan, THANK YOU for your service! she’s pretty damn funny too…. Give her an AU bikini!